The works of famous American photographer and animal painter Mark Laita recently gained much popularity. His unique works were used for advertising at such major brands as Mercedes-Benz, BMW, Adidas, Apple, Visa and others. New photoshoot “Serpentine” presents an original beauty of world’s most deadly snakes frozen in bizarre patterns, sharply contrasting with the black background. 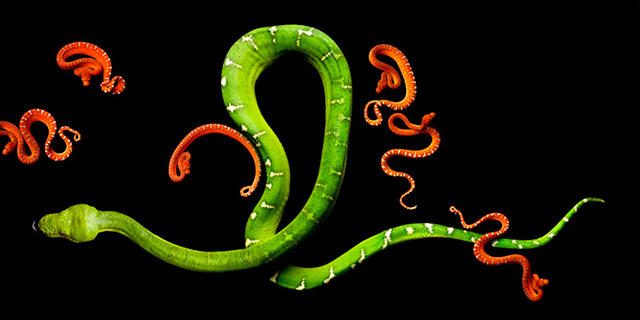 The visual series of images attracts an incredible colouring geometry and dangerous elegance of snake bodies. The artist himself called this show “charming, paralyzing beauty on the verge of fear and unpredictability”. Mark Laita was born in 1960, the son of immigrants from the Baltic States. He had to spend his childhood in Detroit, Michigan, in the not very safe area, among the children of ordinary working families. However, at the age of 10, he began to be fond of photos, noting special angles among ordinary things. Mark’s family moved to Chicago, where he discovered the world of photography in all its breadth. The boy used his leisure time for his hobby. The gifted teenager was quickly noted in the circles of local photographers, who predicted a successful future for him. Mark Laita earned a degree in photography from Columbia College and the University of Illinois/Chicago. In 2010, he published 2 books with illustrations of his works. He was able to build a decent career and profitable business. Mark collaborates with major studios in New York and has been living in Los Angeles since 1986, creating new series of photos. Before implementing this project, the photographer travelled a lot of places in the United States and Central America in search of interesting species of the most poisonous snakes. He met with breeders of reptiles, owners of private terrariums, collectors, zoo staff and anti-poisonous laboratories. In the end, Mark Laita was able to create and show us breath-taking pictures of these mysterious graceful animals.